One hundred and seventy years ago, Ireland was in the throes of a genocidal famine during which the island lost between twenty to twenty-five percent of its population. 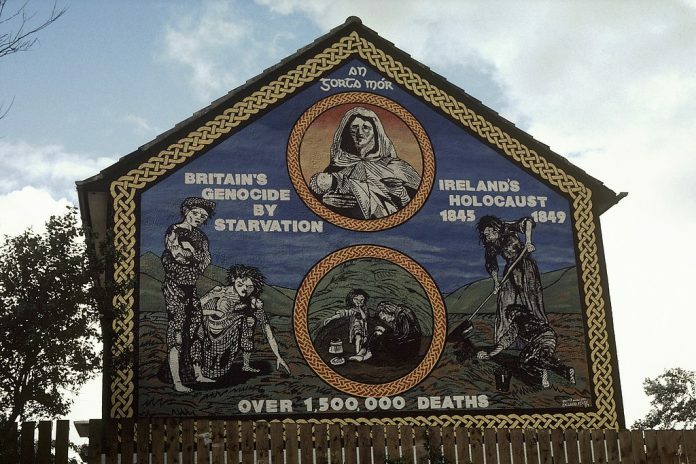 During the half-decade long famine, over one million Irish died from starvation or famine-related illnesses. During this same period, another million and one-half Irish emigrated to the United States, about one in five of whom died as a result of the deplorable conditions to which they were subjected while crossing the Atlantic. I called this humanitarian disaster a genocide because it could have been avoided if not for deliberate British colonial policies that denied Irish Catholics access to their land, opportunities to become educated, to find meaningful employment and to otherwise share in the wealth that was produced in Ireland for the benefit of the British homeland. The proximate cause of the famine was a blight that destroyed the island’s potato crop, which because of British policy had become the main source of nutrition for the Irish Catholic population. Rich farmlands had been seized by the colonial government and were operated by British landlords who produced grains and livestock for export to England. All that was left for the Irish were small plots of less fertile, often rocky lands on which they were able to grow potato crops and came to depend on for sustenance. It is estimated that in the period before the famine, the potato had become the staple food for almost one-half of the Irish. When the blight destroyed three-quarters of the potato crop, the Irish starved. What compounded this tragedy was that Ireland was that during this same period they were a major food exporter. While hundreds of thousands of Irish were dying of malnutrition and disease, Ireland’s British overlords were exporting millions of tons of food to feed their English compatriots. It is reported that 4,000 ships laden with food left Ireland for England in just one year of the famine. Why did the British let the Irish die? In part, because they were locked into their own policies of cruel dispossession in which they had created and empowered a class of “landowners” who had developed political clout and whose exports were important to England. Another reason was racism, plain and simple. The British described the Irish as a “wretched lot” and saw the famine as a punishment for “Irish inequity” and an “act of Providence” to help reduce the Irish population, thus facilitating the British colonial enterprise. As disturbing as this history is, the fact that it is not widely known in the West is inexcusable. While Americans vaguely know about the famine, we do not learn about the role that British imperial policies played in this tragedy. It was only in the 1990’s that I became aware of this history and the extent to which it is emblazoned in the Irish consciousness. As I was to discover, his reaction was not uncommon and led us to read and learn what we had not learned in school. We found a book “Paddy’s Lament,” which is a powerful history of the famine and its consequences. During the past century after a bloody revolution, the Irish in the south gained their independence from Britain, while the north remained part of the United Kingdom. Irish nationalists continued to fight for unity and independence of the entire island. The Good Friday Agreement, negotiated between Great Britain and the Republic of Ireland, created a framework for coexistence which brought a period of peace and stability and an erasure of the border. This is now being threatened by Brexit. It was in the context of this history that I marvelled at the speech delivered this week by the Irish Taoiseach (Prime Minister), Leo Varadkar at Ireland’s Washington Embassy annual St. Patrick’s Day celebration. He spoke eloquently about the Irish emigration to America, the hardships they endured, the amazing success they achieved, and the lasting bonds they had built between Ireland and the U.S. He also spoke passionately about the ties that bind the people of the north and south of Ireland, without even a hint of resentment and anger at the bloody past. While not dismissing the challenges that remain, he expressed optimism about the future. It is clear that history can be transcended and it appears that despite their legacy of pain the Irish are doing just that. But there are prerequisites to overcoming past wounds. In the first place, history must be known and the past wounds acknowledged. There must also be at least a modicum of justice. And finally, with justice, there must be the opportunity to benefit and prosper all of which can ease the hurts of the past and create new possibilities for the future. Absent acknowledgement, justice, and the opportunity to prosper, old wounds continue to fester. But when they are realized, the painful past can be a stepping stone to a better future. 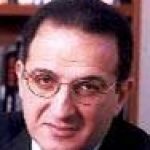 Is there reason for hope in Palestine?